Every year I have to have at least one type of macaron in my Christmas cookie package because they are my favorite type of cookie. This year I have two, one old one new. Today I'll be posting about peppermint macarons (the new) and later I'll be posting about pistachio macarons (the old, spiced up of course). A couple of weeks ago, I spotted candy cane shaped macarons on Almost Bourdain, which were made following a recipe by the famous Adriano Zumbo. 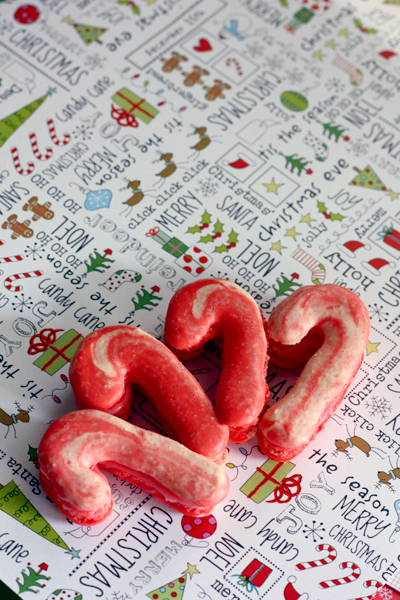 The moment I laid my eyes on those macarons, I knew I'd have candy cane shaped macarons on my cookie list this year. 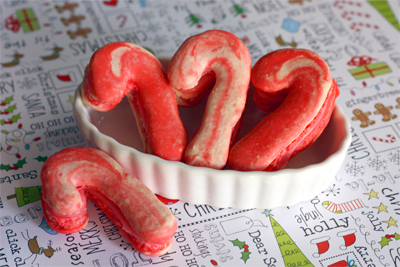 I took that method of making candy cane macarons and adapted it to my trusty basic macaron recipe, which worked like a charm. Line a couple of baking sheets with parchment paper. 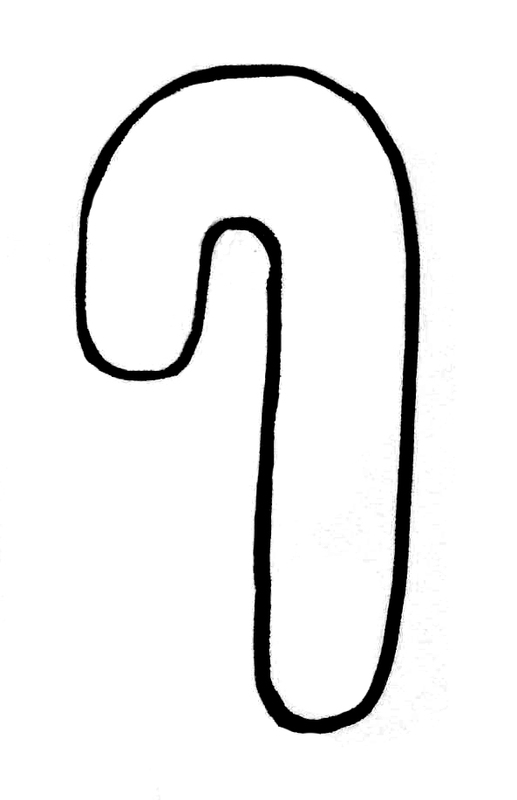 Print out the candy cane stencil I provided below (1 1/4" x 2 1/2"), or draw your own stencil. Tape two sheets of blank printer paper together to form a large sheet about the size of your parchment. Trace the stencil onto the now large sheet of paper, nine candy canes facing the left, and on the other half, nine candy canes facing the right (flip the stencil around). Set aside for now. Mix the powdered sugar and ground almonds together. In a clean bowl, add your aged egg whites and salt. With an electric mixer, beat on low until frothy. Turn up the mixer to high and slowly add in the granulated sugar as you continue to mix till the whites are stiff peaks (when you lift up the mixer, there should literally be stiff, shiny peaks). Add in the peppermint extract and mix a few more seconds. With a spatula, gently fold in the powdered sugar/almond mixture until incorporated. Place half of the mixture in a separate bowl and gently mix in red food coloring into that half. Place a plain piping tip in a piping bag and scrape the red batter into one half of the bag and the white batter into the other half. 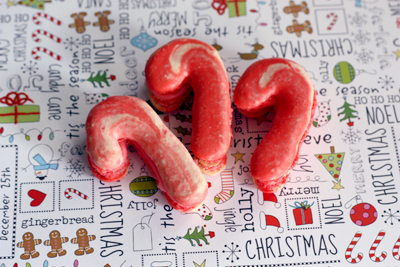 Now take that large candy cane stenciled paper and place it under a piece of parchment and use it as a guide as you pipe out your candy cane macarons. When done, slide out that paper and place it under your other parchments and repeat. Let your macarons dry for a few hours, until the tops are completely dry and a shell has formed. Preheat the oven to 325°F. Bake your trays one at a time for 8-10 minutes or until the macarons are set on top. Let them cool on the parchment on a cooling rack. When cool, carefully peel the shells off the parchment. Pair all the macarons up by matching size. Fill a piping bag with peppermint filling (recipe below), pipe filling onto one half of a pair, and sandwich the filling with the matching macaron shell. Once done, refrigerate the macarons to let the flavors meld. Place the white chocolate in a heat-proof bowl. Heat the cream over the stove. Once boiling, remove from heat and pour over the chocolate. Mix until all the chocolate is melted. Then add the butter and mix till even. Add the peppermint extract and food coloring. Let set in refrigerator for a few hours, until spreadable. How beautiful! I've never made any as I think it is so complicated but always look at everyone's photos with a bit of envy. Well done! 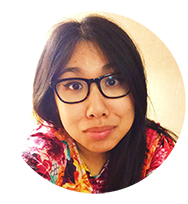 Jolita: Thanks! Macarons can be a bit tricky to make the first time, but after that, it gets easier and easier. And Happy New Year to you too! dbites: I love macarons too :D! They were indeed quite delicious. Thanks!